The Grand River Power Company operated the Smithville Dam, which sold power to Wolverine Power Supply Cooperative. Its downstream partner, Mix Dam, also supplied power to 52 retail electric customers which made up the Electric Utility that was operated from that site. Below, is Commonwealth Power Company’s LaBarge Dam located on the Thornapple River in Kent County, Michigan. It achieved commercial operation in 1982, selling its energy and capacity to Consumers Energy Company. North American’s affiliate companies ran standby diesel projects which consisted of either mobile generating units or station plants. The plants were constructed, owned and operated primarily during the 1990s. A project for the City of Eaton Rapids, Michigan was operated in the 1990s period for the purpose of supplying backup power for the City’s interruptible purchases from Consumers Energy Company. The two units were Fairbanks Morse Opposed Piston 38 D 8 1/8, which were dual fueled, being able to run on either natural gas or diesel fuels. The unit being unloaded was 1,365 kW. The housed unit was 2000 kW, and was turbo charged. 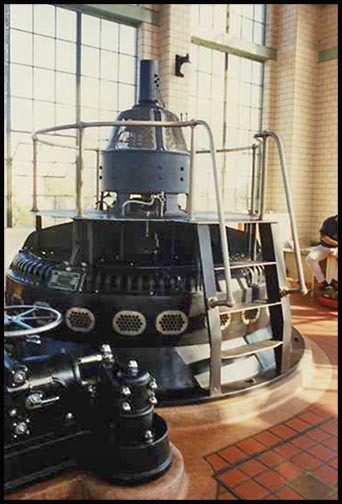 The Stirling Engine Project was owned and operated by a NANR affiliate. The engines ran for approximately one year. During that period, the units achieved approximately 22 kW compared to the 25 kW expected each of other conventional Caterpillar generating units operated by the North American produced. The time to overhaul was also low, approximately 10,000 hours. These factors led to their eventual removal. The generators and controls used on the Stirling units were conventional induction systems. The units were placed on stands (shown below) for ease of maintenance and to keep them out of snow.